Alex Morgan suits up for the Olympic debut of Procter & Gamble’s #LikeAGirl campaign. Releasing a survey about why half of girls quit sports by the end of puberty, the Always brand partnered with a documentary filmmaker to share stories about how girls feel about playing sports in a video that’s garnered an impressive 23 million views (see video below). The campaign is also helping 2500 Brazilian girls gain access to sports, a focus area of the IOC. Data from the most recent Always Confidence & Puberty Survey*, shows that by the end of puberty, half of girls surveyed (51 percent) will have quit sports. To help shed light on this issue, Always partnered with Academy Award-nominated documentary filmmaker Nanette Burstein to find out how girls feel about playing sports. 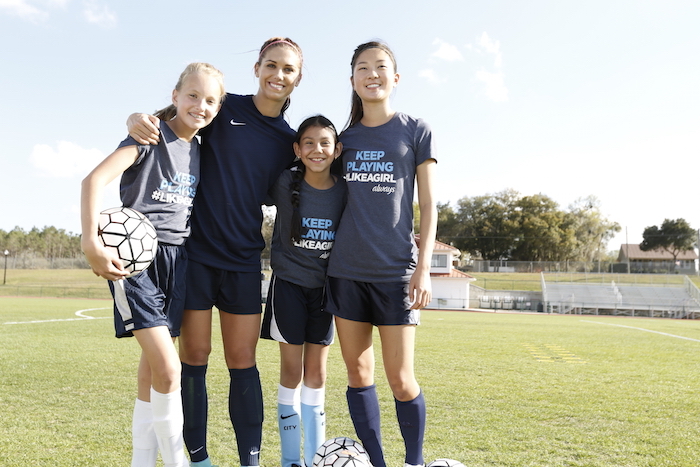 The new #LikeAGirl video, asked girls about their athletic experiences, the challenges and the benefits, what helped them stay in the game, or what led them to quit.